WIKIMEDIA, TIIA MONTOIn mice, just before bedtime, neurons of the master circadian clock release the neurotransmitter vasopressin to activate the brain’s thirst center and prompt the animals to drink, according to a paper published today (September 28) in Nature. The study represents the first mechanical description of how this clock drives behavior in mammals. Sleeping, eating, body temperature, urinating—there is a long list of behaviors and physiological processes in mammals that are governed in part by circadian regulation. Each of these is ultimately controlled by the brain’s master clock: the several thousand neurons constituting the suprachiasmatic nucleus (SCN) within the hypothalamus. “We know that the clock cells oscillate and that in general they serve to anticipate forthcoming needs, but . . . the evidence, up till now, of specific functions for specific cell types within the SCN has been relatively vague,” said neurobiologist Rae Silver of Columbia University in New York City who also did not participate in the study. Charles Bourque of McGill University in Montreal, Canada, studies how the mammalian brain controls the body’s fluid homeostasis—how it tells the kidneys to increase or decrease urine production, induces feelings of thirst, and so on. During sleep, water intake ceases, so to prevent possible dehydration, rodents increase their fluid intake immediately before nodding off. Bourque and colleagues have now shown that this pre-sleep drinking behavior is driven by the clock, and have examined how the SCN exerts control. First, they determined that the pre-sleep increase in fluid intake was not motivated by physiological factors known to induce thirst, such as increased body temperature, increased blood osmolarity or decreased blood volume. Then, the researchers discovered that neurons in the brain’s thirst center—the organum vasculosum lamina terminalis (OVLT)—were more electrically active during the immediate pre-sleep period. The team went on to show that certain SCN neurons projected their axons into the OVLT, and that these SCN neurons showed a similar pre-sleep activity increase to that of the OVLT cells. 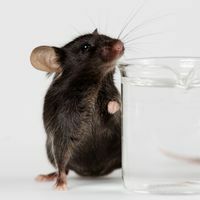 Using optogenetic techniques, the team showed that stimulation of the SCN neurons projecting to the OVLT in live mice prompted the animals to increase their intake of water regardless of the time of day. 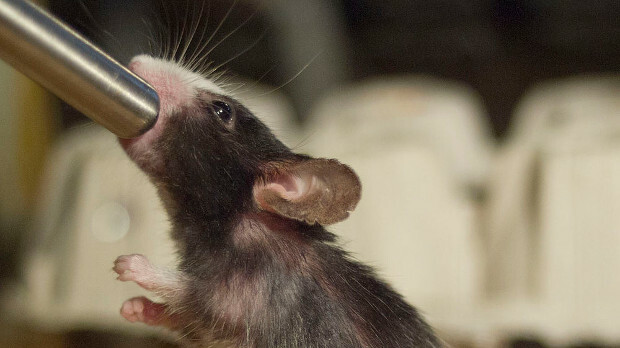 Optogenetic inhibition of the same neurons during the pre-sleep phase, on the other hand, prevented the animals from drinking as they would normally. “They’ve done an excellent job of . . . joining the dots, neuroanatomically,” said neurobiologist Michael Hastings of the MRC Laboratory of Molecular Biology in the U.K. who did not participate in the study. 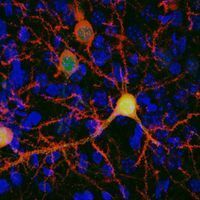 The SCN neurons controlling OVLT activity expressed the neurotransmitter vasopressin, and the researchers showed that this peptide was both required for—and alone sufficient to activate—OVLT activity. Whether vasopressin regulates all circadian-controlled functions remains to be determined. 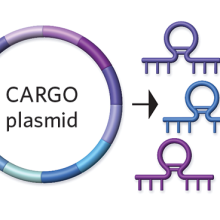 The SCN expresses a variety of transmitters, so it’s possible that certain circadian functions require other molecules. The finding that vasopressin drove mice to drink brought an interesting twist to the story of fluid homeostasis. Aside from its role as a neurotransmitter, vasopressin is a hormone produced by the pituitary gland, Bourque explained. And, in that capacity, vasopressin suppresses urine production in the kidneys. Thus, as neurotransmitter and hormone, vasopressin promotes two different ways of staying hydrated—one behavioral and one physiological. C. Gizowski et al., “Clock-driven vasopressin neurotransmission mediates anticipatory thirst prior to sleep,” Nature, doi:10.1038/nature19756, 2016.